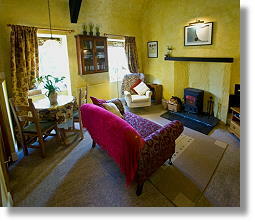 The oldest part of the house, used as an artists studio in Victorian times has been converted into a self catering holiday cottage apartment for two adults. 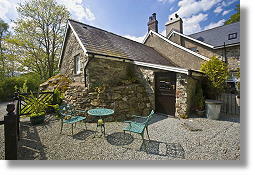 This self catering holiday cottage near Betws-y-Coed has been named 'The Studio' in recognition of its artistic past. This is a holiday vacation rental with plenty of character but also modern comforts. The Studio offers quality self-catering accommodation overlooking the beautiful Lledr valley, yet only 1 mile from Betws-y-Coed - the premier inland resort of North Wales. 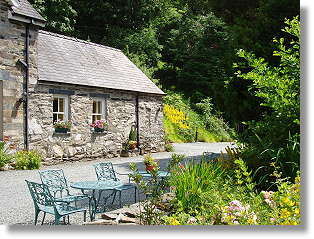 Occupying a wing of the owners country house together with an outside furnished sitting area, this delightful self-catering cottage with its wood burning stove, provides a cosy, romantic retreat and an ideal base for discovering the scenic delights of the Snowdonia National Park. Entry to the cottage is via the patio area through a stable door into a compact well equipped hand made pine and beech kitchen with local slate floor. 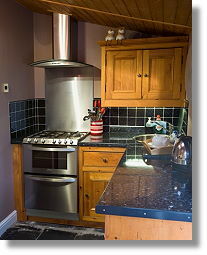 The kitchen contains microwave and cooker, washing machine, and fridge with freezer compartment. The comfortably furnished living/dining room has picture lights, slate hearth, satellite TV with Radio, DVD player and the much loved wood burning stove for those cosy cool evenings. Access to a galleried double bedroom and ensuite shower room/w.c. 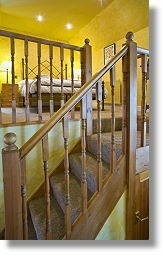 is via six steps from the living room. This self catering cottage accommodation is an ideal base for exploring Betws-y-Coed, Snowdonia and the rest of North Wales. 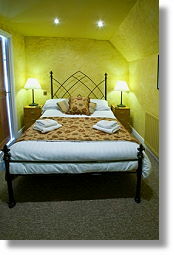 For those looking for quality serviced accommodation, bed and breakfast accommodation is available in the main house. 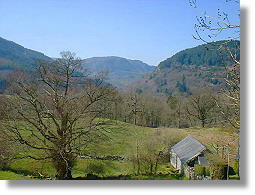 Content is copyright The Studio Holiday Cottage, Pengwern Country House, Betws-y-Coed, Snowdonia, UK.